The word “prosthodontics” is definitely a mouthful! Prosthodontics (pronounced prahs – tho – dawn – ticks) is a specialty field under the umbrella of dentistry. Another way to describe prosthodontics is prosthetic dentistry. According to the American College of Prosthodontists, a prosthodontist must graduate from dental school and then complete an additional three to four years of rigorous specialty training. 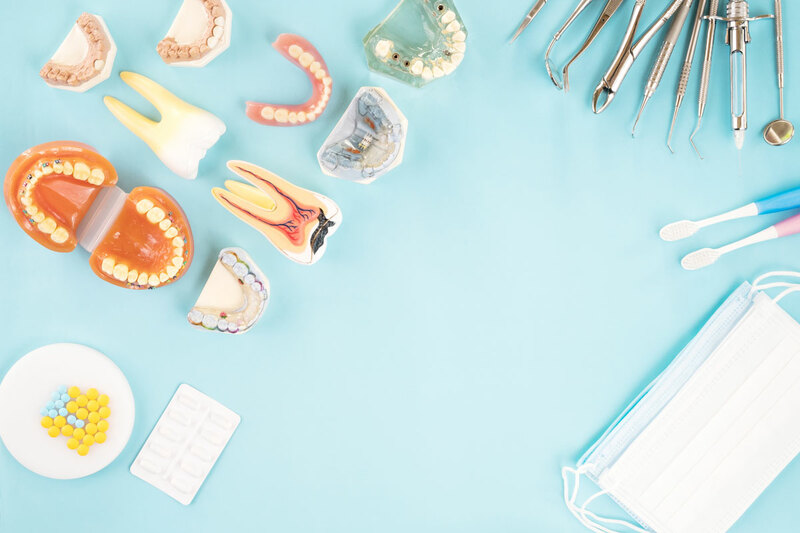 Prosthodontics focuses on treating patients with a variety of oral health needs related to missing or malformed teeth, jaw or mouth structures or tissues. The goal is always to restore optimal oral health and function as well as aesthetic restoration. In this post, learn more about each of the 4 branches of prosthodontics and how they can help you or a loved one. Each of these 4 branches of prosthodontics focuses on treating a different area of the mouth or jaw. Fixed prosthodontics is a sub-specialty that focuses on producing dental prostheses that are permanent. Once installed, a fixed prosthetic cannot be removed. Examples of fixed prostheses can include artificial teeth, crowns (caps), bridges, inlays (modified crowns), onlays (modified inlays) and veneers (covers for the tooth surface). Common reasons why you might seek out a specialist in fixed prosthodontics is if you have had a root canal and a portion of your natural tooth is now missing. Onlays, inlays and crowns (caps) are very common fixed prostheses used in prosthodontics dentistry every day. If you are not happy with the appearance of your teeth due to discoloration or unevenness, veneers can give your smile uniformity. Bridges are used to correct tooth gaps for similar reasons as well as for bite integrity. Removable prosthodontics is a sub-specialty that focuses on producing dental prostheses that can be removed. Instead of being installed, removable prostheses are fitted. They are designed to be used comfortably for long stretches of time and removed for cleaning. Examples of removable prostheses can include dentures (complete or partial) and gingival veneers (surface covers for the base of the tooth to hide discoloration). Common reasons why you might seek out a specialist in removable prosthodontics is if you want to have a removable bridge or set of dentures installed to correct missing teeth, gums or tissues due to injury, tooth loss, illness or disease. If you have receding gums that reveal discoloration near the base (neck) of the teeth, you may also wish to have removable gingival veneers installed to cover this color difference. Implant prosthodontics is a sub-specialty that focuses on using implants, small titanium cylinders, to secure fixed prostheses in place inside the mouth. A variety of different types of dental implants exist. Examples of implant prostheses include individual crowns, larger bridges and fixed and removable implant dentures. Common reasons why you might seek out a specialist in implant prosthodontics is if you are unhappy with a removable prostheses such as dentures, if you have lost entire single teeth (including the root) due to injury or disease, if you have lost multiple teeth and wish to have a bridge and similar dental health needs. Maxillofacial prosthodontics is a sub-specialty that focuses on correcting malformed or missing tissues and structures, whether present congenitally (from birth) or acquired due to disease, illness or injury. Often these missing tissues or structures can create difficulties with speech, swallowing and chewing. Disfigurement is not uncommon when tissues or structures are missing. Maxillofacial prostheses can be intra-oral (inside the body) or extra-oral (outside the body). Examples of intra-oral maxillofacial prostheses can include palate covers, palate lifts, palate drop, jaw replacement and fluoride carrier (designed for medical protection due to disease or illness). Examples of extra-oral maxillofacial prostheses include eye (ocular, orbital), ear (auricular), nose (nasal), mid-facial, somatic (part of the body) or radiation shield (designed to be used when undergoing radiation treatment). Common reasons why you might seek out a specialist in maxillofacial prosthodontics include treatment of cleft palate, mouth or jaw reconstruction following cancer treatment or trauma to the region, mouth or jaw reconstruction due to congenital defects, treatment and reconstruction of under-developed or missing facial or mouth structures and protection of existing structures and tissues during cancer treatment. There is no doubt that dental science has increased by leaps and bounds over the last decade alone and new advances continue to provide better fitting, simpler and more satisfying solutions to a wide range of dental and oral health issues. It is vital to entrust your dental prostheses needs only to a prosthodontics specialist who has completed the additional three to four years of specialized education and training required to provide superior dental care. Contact us to schedule your consultation.